There multiple occurrences of legacy terms in the spec. 9. 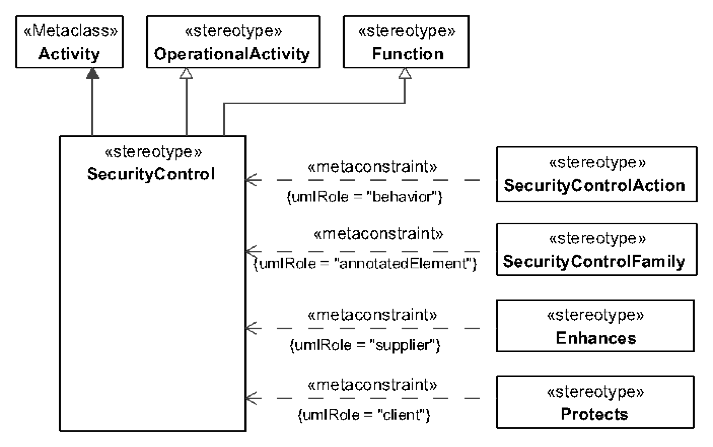 Function definition p. 98 "of" to "to"
security controls are currently stereotypes from UML Activity. 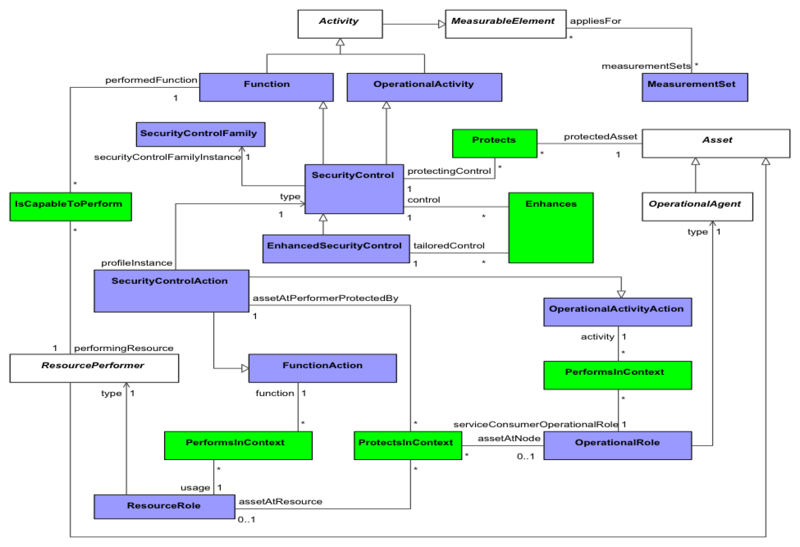 Refactor and rename: current UML activity stereotype to be renamed SecurityProcess or SecurityActivity and refactor old SecurityControl element to be a stereotype of a SysML requirement type with a potential subtype of Information security control. This proposal has had its formatting improved to make it easier to read. I see capability is defined as “A high level specification of the enterprise's ability to execute a specified course of action.” Not sure I like it. If you said ‘A high level specification of something that enables the enterprise's ability to execute a specified course of action I would be a whole lot happier. The way both “official” definitions are worded I don’t think there is anything that is “countable” and therefore there is nothing that exists as an item to be captured in a structured model. 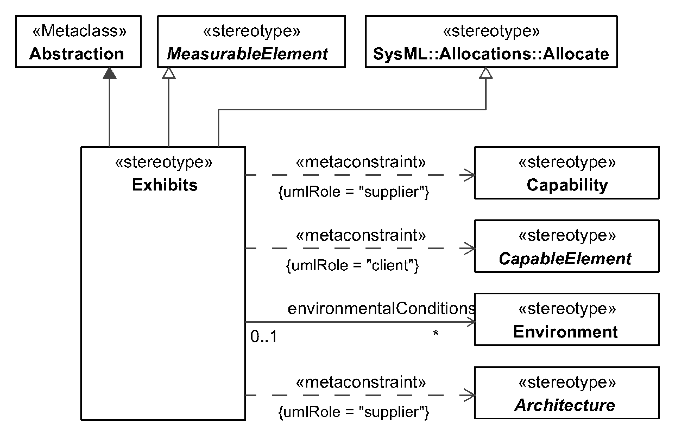 I would argue that the chanes is needed to make the items countable and to then appear in a UML model and also question why competing definitions are necessary. these are all the same, define once. 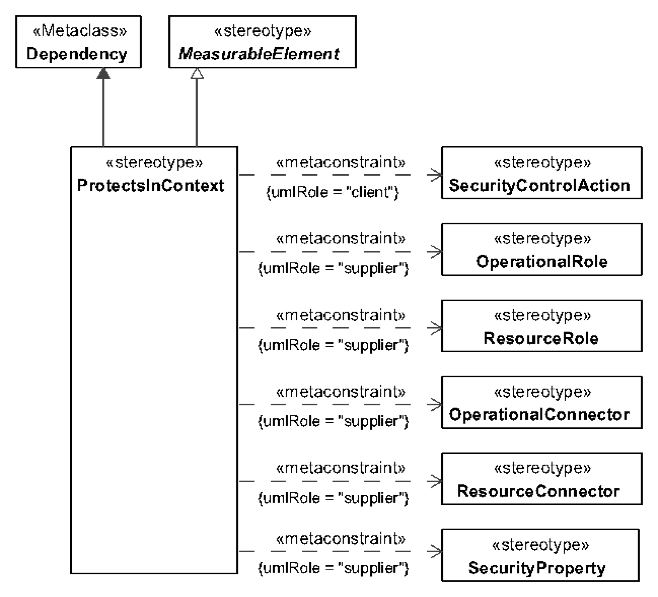 profile: class library, elements called ExchangeProperties, SecurityCategoryProperties, SecurityControlProperties all have properties called criticality. 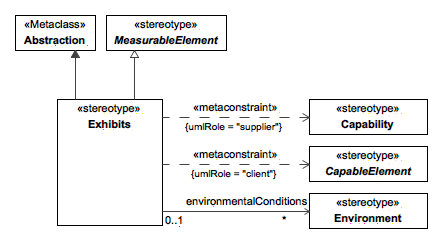 a) criticality and interoperabilityLevelAchievable needs to be removed from ExchangeProperties. Need to think about backward compatibility. Security Confidentiality missing from UAF-DMM see package Security, DMM has availability and integrity but not confidentiality. 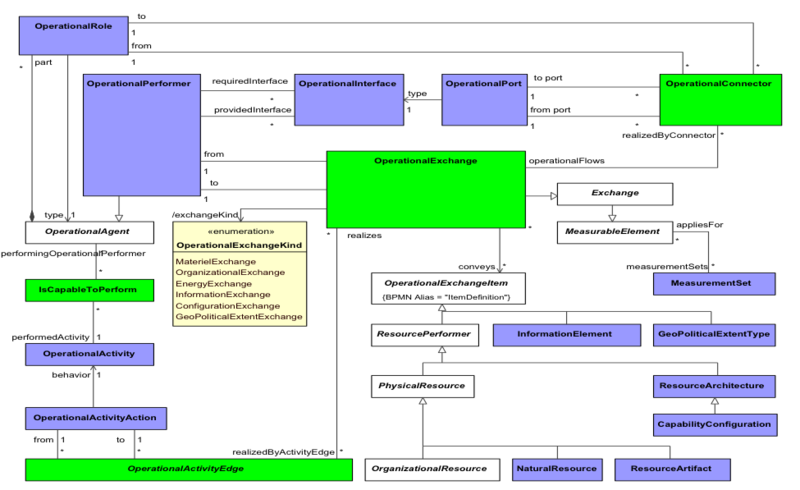 If I want to populate an L3 diagram I am asked for an operational exchange item and this quickly ends up in a selection of information elements. When I create state machines the only trigger I can make use of is a signal event if I need to handle asynchronous information flowe. This to me indicates that the only way to tie the two together would be to create the same amount of information elements as there are signals and allow the signal to have a single parameter typed by the information element. This would allow me to create a trigger based on the signal and also get an operational exchange item that points to the information element by the same name. To me this seems somewhat redundant. The question is therefore whether exchange should also be allowed to be a signal in order to open up the possibility of a consistent way of dealing with with state machines and other types of diagrams. Add signals to UAFP at the operational and resource levels. The Project Activity element was left out of the UAF 1.0 specification. 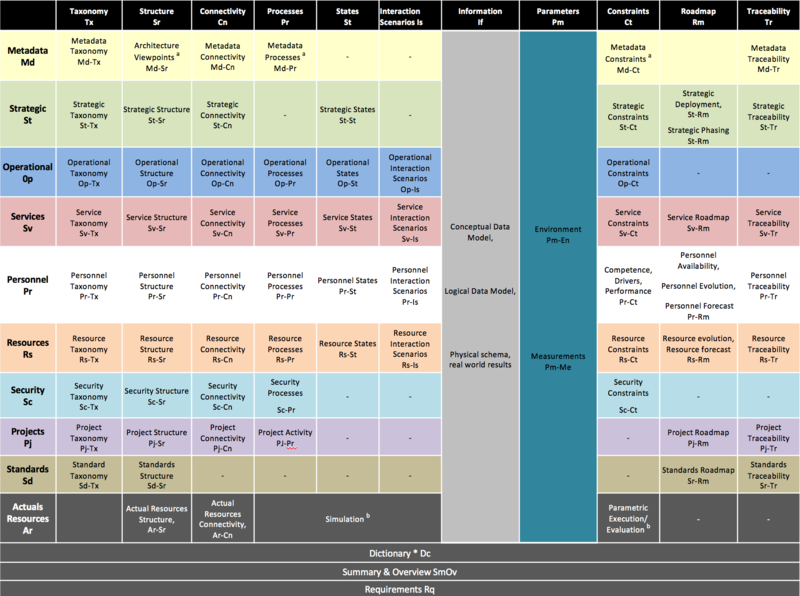 This was previously in section 8.3.1.2.1.3 ProjectActivity of the UPDM 2.1 specification. The Project activity views were left out of the UAF 1.0 specification. There were in the section 8.3.1.2.1.3 ProjectActivity of the UPDM 2.1 specification. 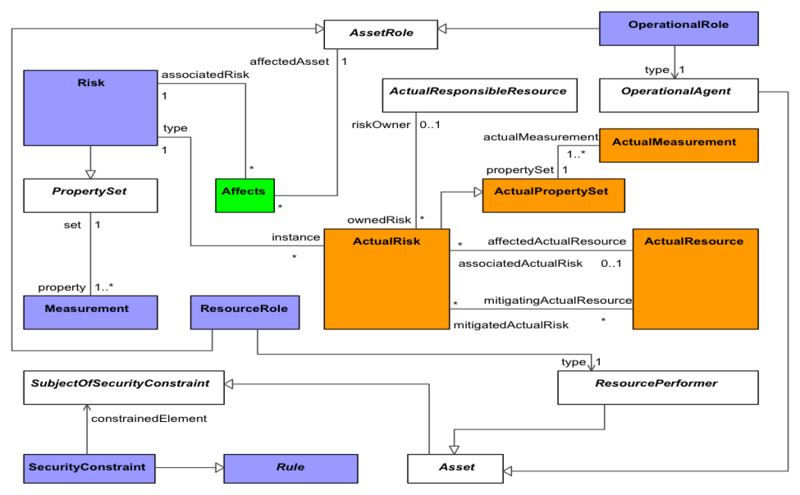 ActualEnduringTask and ActualRisk are missing from the ActualPropertySet diagram. 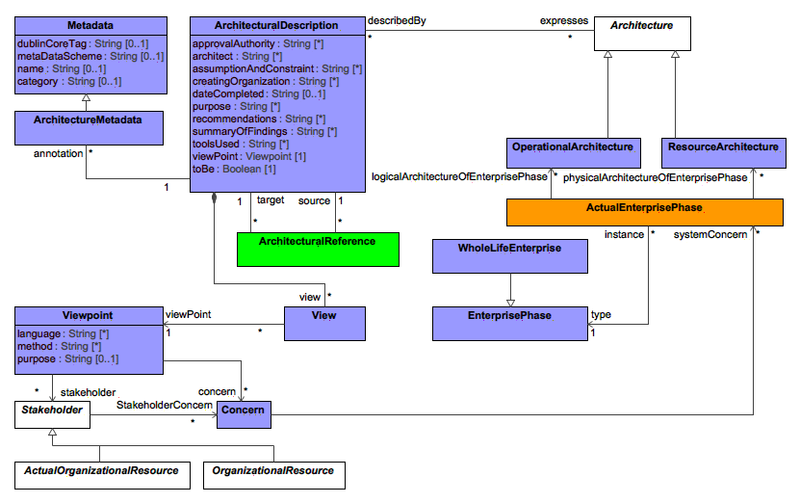 Architecture in the diagram for Exhibits is not needed. 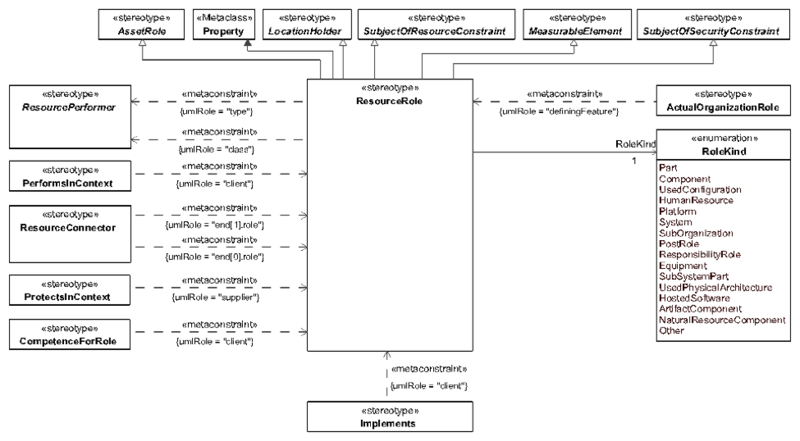 It duplicates the tags on the Operational and Resource Architecture elements. 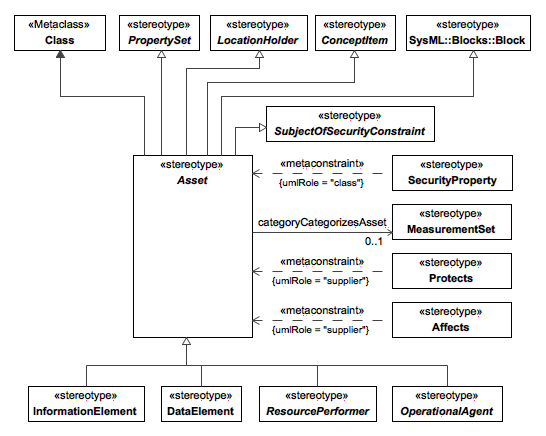 Architecture is related to Enterprise Phase by specific tags. Having exhibits relationship for the same purpose duplicates this capability and confuses end user. 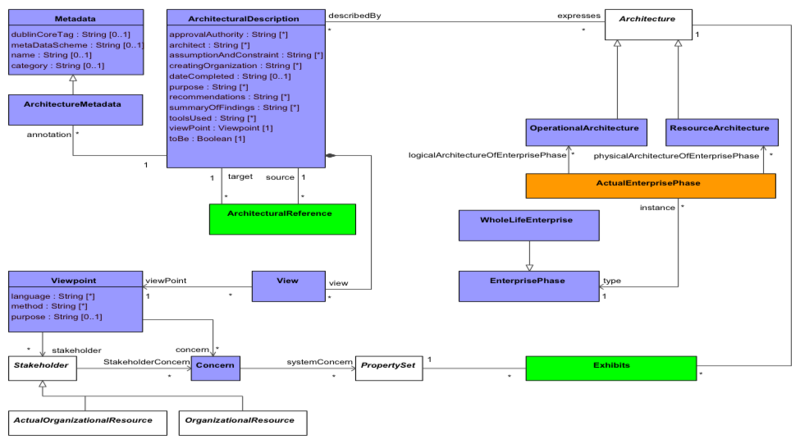 As a resolution Architecture is removed from Exhibits diagram. It is Actual Enduring Task that is implemented by Operational Activities. Not the Enduring Task. 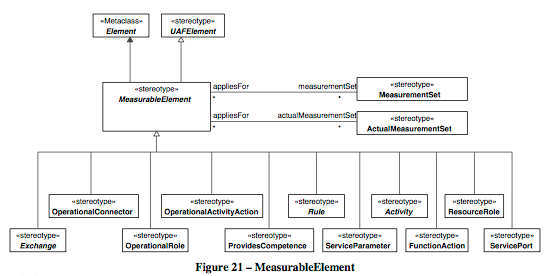 Implements relationship links Operational Activity to Actual Enduring Task not the Enduring task as it is depicted in diagrams for Enduring Task and Implements. 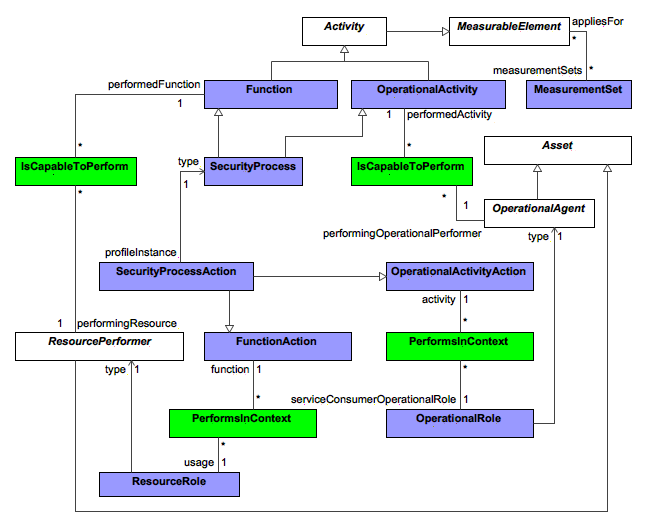 As a resolution Enduring Task is removed from Implements diagram and Implements is removed from Enduring Task diagram. definition for element Risk includes Information security risk definition. “A statement of the impact of an event on Assets. It represents a constraint on an Asset in terms of adverse effects, with an associated measure. The measure is used to capture the extent to which an entity is threatened by a potential circumstance or event. Risk is typically a function of: the adverse impacts that would arise if the circumstance or event occurs; and (ii) the likelihood of occurrence. " 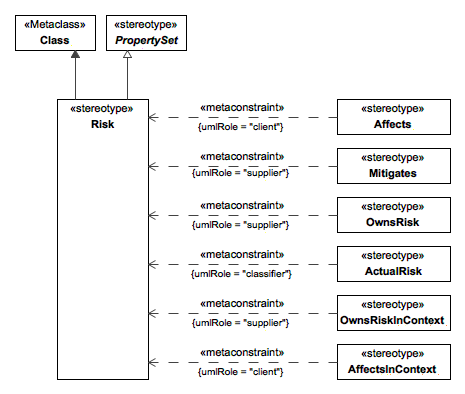 users can define subtypes of risk to include Information security risk, cost risk, schedule risk, etc. UAF will define only Risk. This issue is related to multiple UAF classes and stereotypes but will be illustrated with “Organization” and “ActualOrganization”. UAF contains a taxonomic structure defining useful concepts such as person and organization. 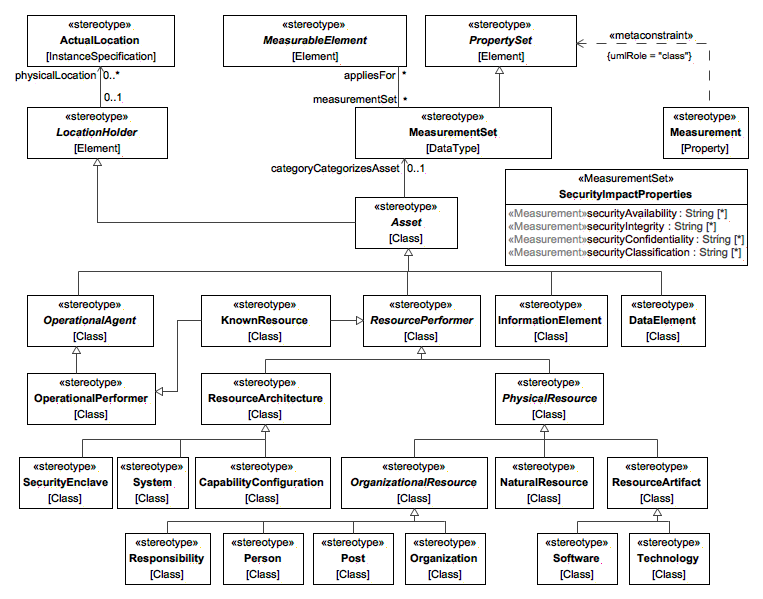 These are then represented in UML & SysML and the UAF Profile. Other concepts (e.g. CommunicationsLinkProperties) are represented in a library of concepts. Our recommendation is to use the library of concepts approach more consistently and to have a much smaller profile. 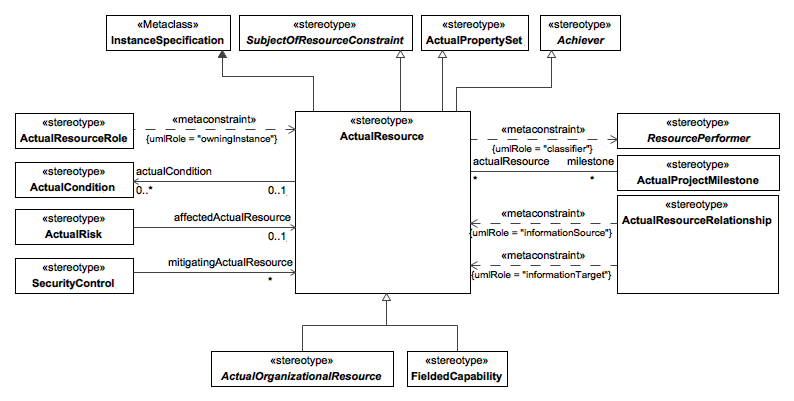 There are multiple ways concepts like “Person” or “Organization” can be represented in UML/SysML: as classes, instances or stereotypes. UAF has chosen stereotypes. 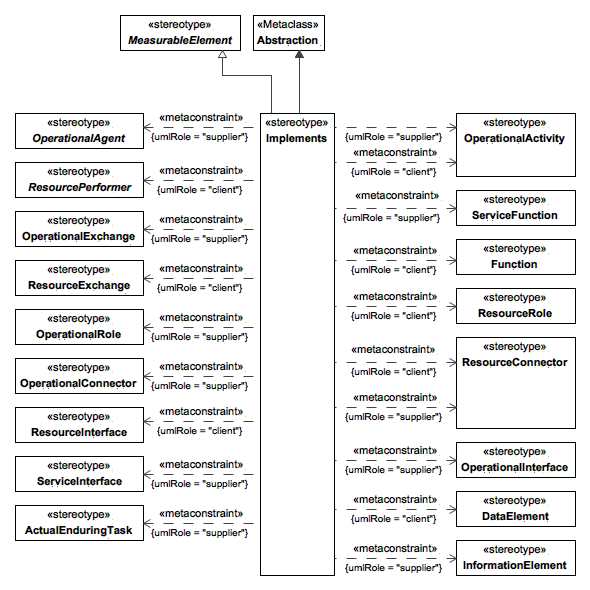 The most common way to use UML would be to define a class (Or sysML Block) “Organization”. Instances of that class would be instance specifications such as “International Maritime Organization:Organizaiton”. Particular kinds of organizations would subclass “Organization”, for example “Corporation” may subclass “Organization”. 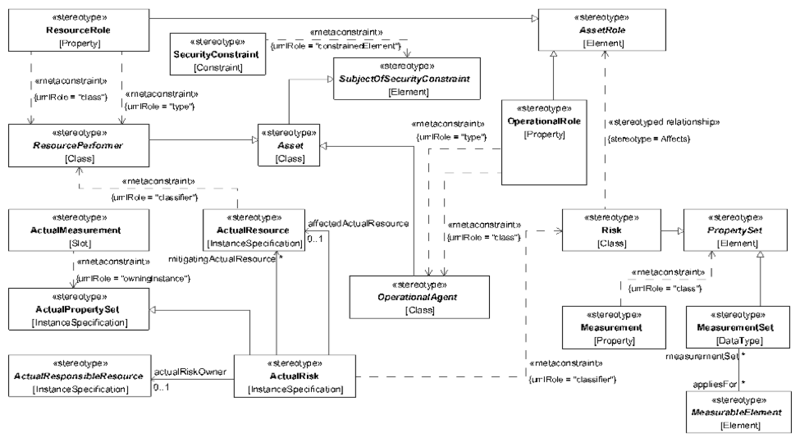 Thus concepts like people and organizations are contained in UML models as classes. Such models may be standardized, reused and extended. 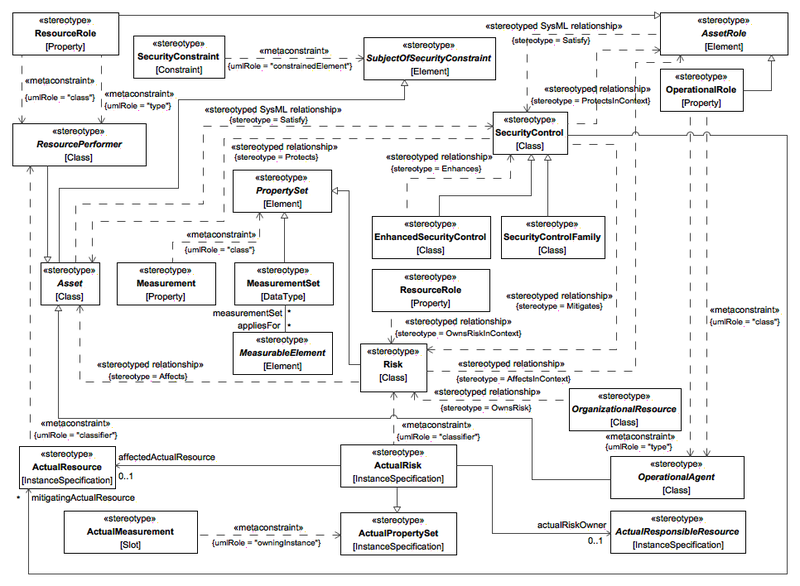 This part of UML is well understood and quite functional. 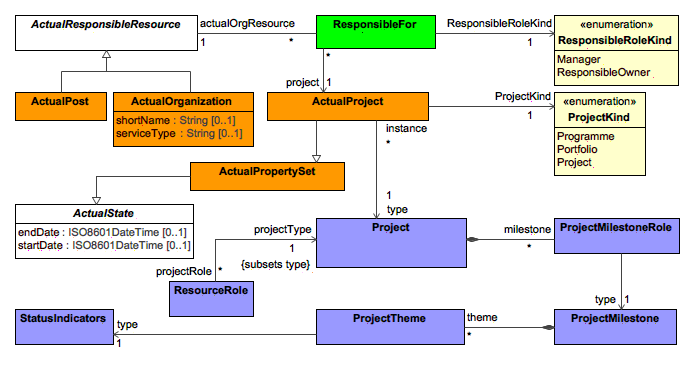 For an instance model, such a type is easily used as in “Object Management Group:Organzation”. UAF has chosen to make each such concept into a pair of stereotypes e.g. <<Organization>> and <<Actual Organization>>. 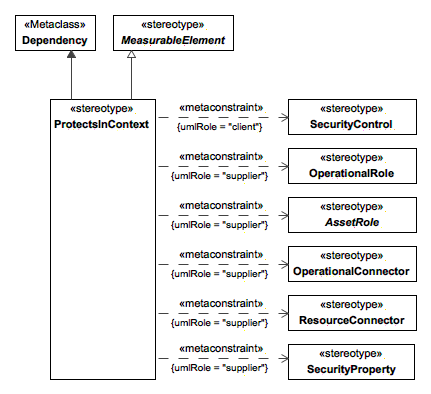 This makes “Organization” and even “Actual Organization” essentially metatypes instead of Supertypes and instances as one would expect in a UML class model. Another interpretation of a stereotype is as a “archetype” which is essentially a distinguished supertype – everything marked with such a archetype is a subtype of the archetype. 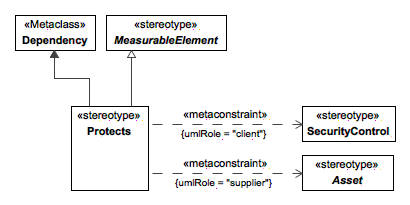 However UAF stereotypes seem to represent metatypes, not Supertypes or archetypes. 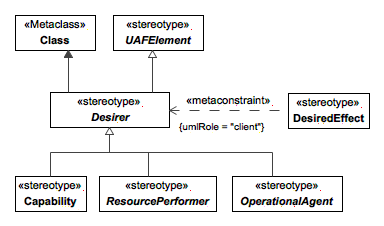 The representation of the UAF taxonomy as stereotypes rather than a class model of Supertypes does not seem to have any clear advantage in terms of defining the concepts. Potential reasons would be: 1) To make the UAF concept appear in the class box, eg, "<<Organization>> Civil Defense Organization". Another may be to allow tools to apply special rules to these types. Both of these effects could be achieved with tooling enhancements referencing a class model. Disadvantage of using stereotypes are: 1) That it makes the taxonomy harder to extend & more brittle. 2) That it makes the UAF profile much larger 3) It requires special UAF tooling. 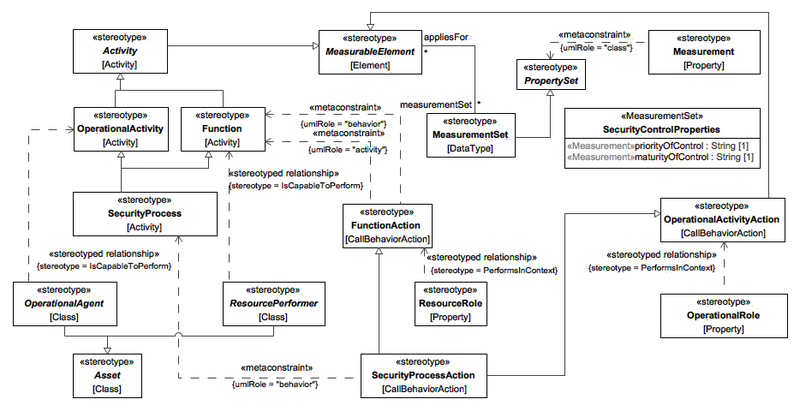 4) It ends up replicating some built-in UML concepts. 5) Complexity 6) Increased learning curve. 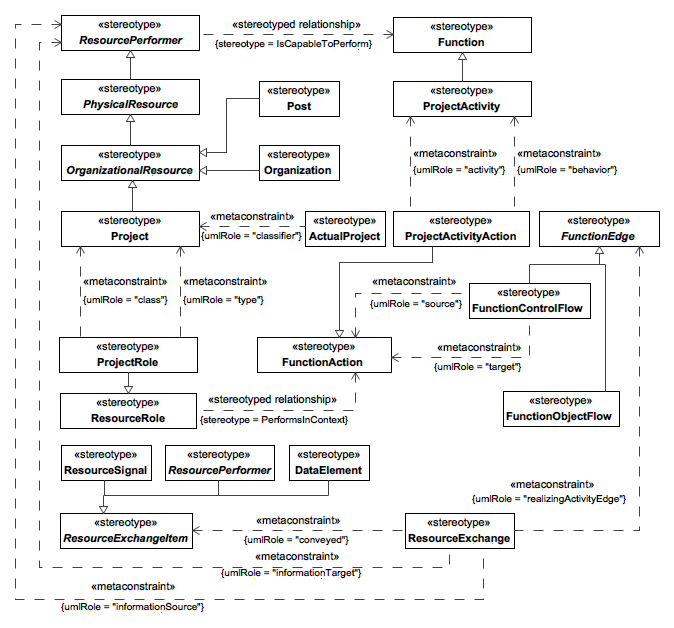 Recommendation: The UAF taxonomy should be represented as a normal UML class hierarchy that is part of the UAF standard – a library of concepts. 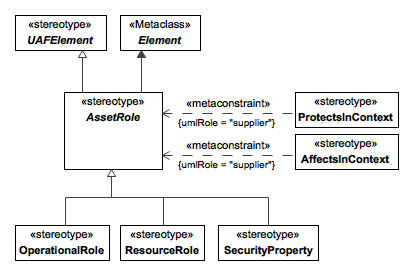 User models may subclass these concepts as needed – this is simple and semantically clear. The “Non Actual” taxonomy may be removed as the classes are types (non actual) and instances of these classes would be “actual”. 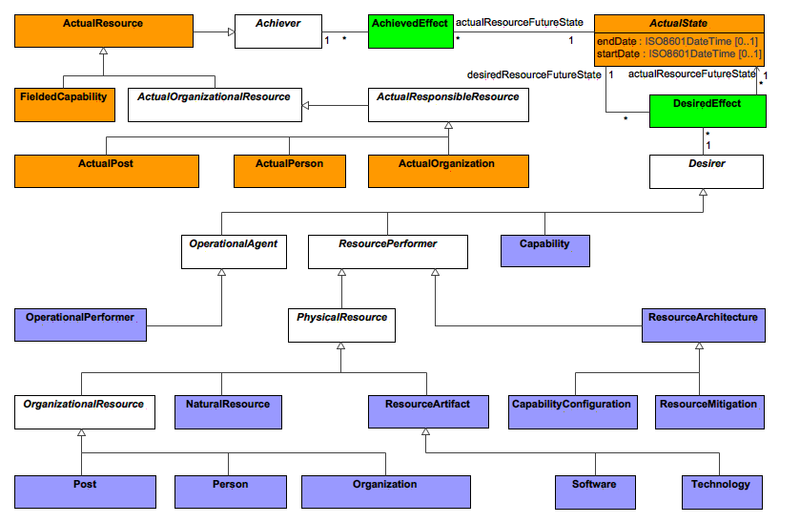 Having a class hierarchy for UAF concepts would be reusable with no dependence of any other part of UAF or SysML. 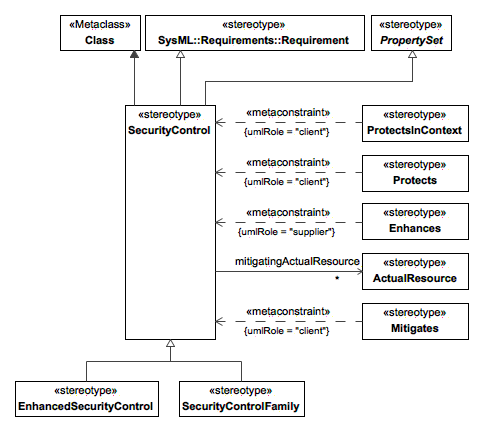 Option: If additional tooling help is required, stereotypes may be defined for distinguished classes in the taxonomy, with the same name. 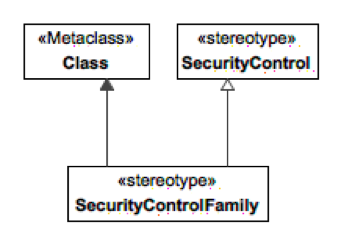 These stereotypes would simply mean that the user defined class is a (direct or indirect) subtype of the UAF defined class. Such stereotypes are sometimes thought of as “Archetypes”. 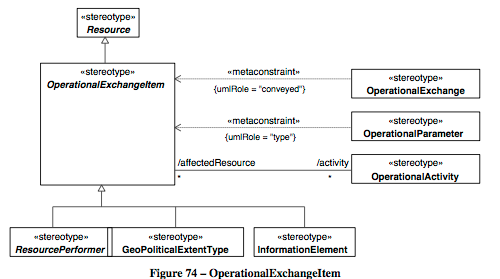 Using this mechanism, there is no reason to define both “Organization” and “ActualOrganization” as UML already has a mechanism to define an instance for any class. Archetype stereotypes would retain more compatibility with Beta UAF. Not in the scope of FTF. UAF::Person: A type of a human being used to define the characteristics that need to be described for ActualPersons (e.g. properties such as address, telephone number, nationality, etc). UAF::ActualPerson: An individual human being. We also note a common definition (dictionary.com): 1. a human being, whether an adult or child: 2. a human being as distinguished from an animal or a thing. Therefor the common concept for the term “Person” is what is defined in UAF as “ActualPerson”. This pattern is consistent in UAF. While consistent it would seem confusing to most. What then, is a UAF::Person? What is a “Type of human being”? Nationality? Age? Capability? These are things one would expect as properties of a person type. We don’t normally recognize subtypes of people. Perhaps UAF::Person is a role or phase of a person like “Policeman” or “Teenager”? If so, this would seem to conflate the concept of person with roles they play, and UAF already provides for roles? Perhaps it is an extension mechanism, just there to add properties or relationships not in UAF? If so, would not a simple subclass suffice? Consulting the example for guidance we see “<<Person>> Marine Radio Operator”, <<Person>> Qualified Lifeboat Driver”. These are clearly roles of a person. Clearly separating what an entity is (A person) from roles they play (Marine Radio Operator) is fundamental to good architecture at any level. Recommendation 1: UAF should clearly distinguish rigid(a) types (like “Person”) from non-rigid(a) roles and phases. Name the classes and stereotypes appropriately using terms like role and phase. Have a unifying concept of “A role of something”, add “Role of a person” only if clarifying. Recommendation 2: UAF should use the common term for entities – e.g. “UAF::Person” should correspond to what is currently UAF::ActualPerson. 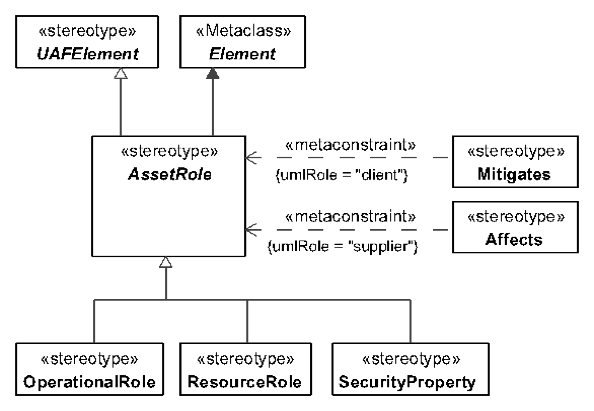 If there is a necessity for a metaconcept, that concept should have a specialized prefix or suffix such as “Type”, “Kind” or “Role”. Recommendation 3: Should it be required to add properties to a type like “actual person”, just use generalization – no additional mechanism should be required. The agreed naming convention in UAF is to name all instances as "Actual something", e.g. "Actual Person". And to name types just simply like Person. We are not using "Type" to name types. Changing naming convention would destroy compatibility with previous versions of the standard and would confuse current users. The Scope of the work does not fulfil the requirements of the Scope statement at the start of the document. In integrated architecture can only exist if the full context of the organization/business/enterprise is described. This necessitates understanding Purpose, the strategic environment, (not just operational things like weather, light, but political, social, economic ), their associated forces and drivers and the role of value. Everything in this document is dependant on this context and all of it is ignored. Based on a list of the participants I understand why these shortfalls exist, NATO does not create strategy, either does Canada DND, US DOD, strategy is created in Brussels, in the White House. These are the Board of Governors for their organizations. 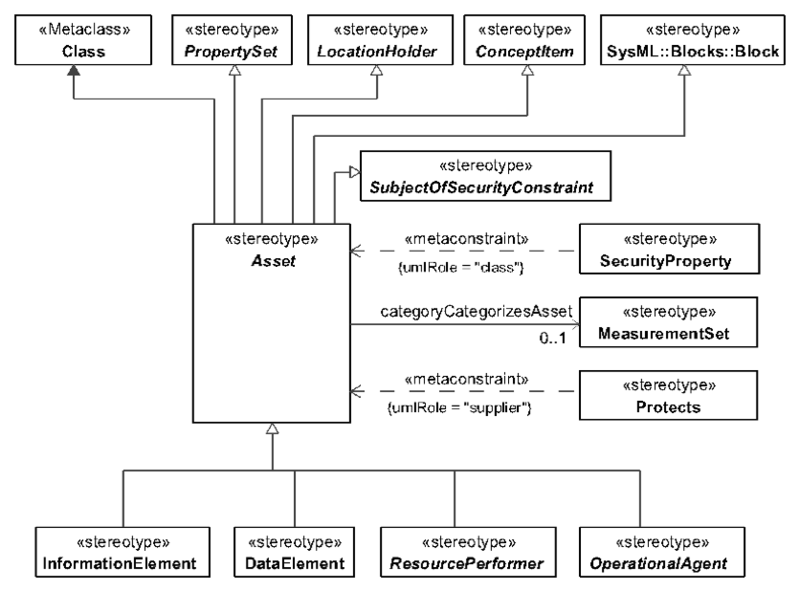 An integrated architecture description requires that that a Systems View that concerns an understanding of a system by examining the linkages and interactions between the components that comprise the entirety of that defined system, it cannot be done by working just with the pieces. I am a business architect. I am concerned with the form and nature of the enterprise system, with mergers and acquisitions and their impact on capability, value creation and deliver, control (also completely missing from the framework), and none of these things are represented. a) Strategic Domain allows to capture strategy, e.g. Enterprise Goals, Vision, Capabilities, Enduring Tasks, etc. UAF also allows to model Requirements and associate any UAF element to them. c) BPMN compliance mode allows BPMN to be used to capture Operational Processes. 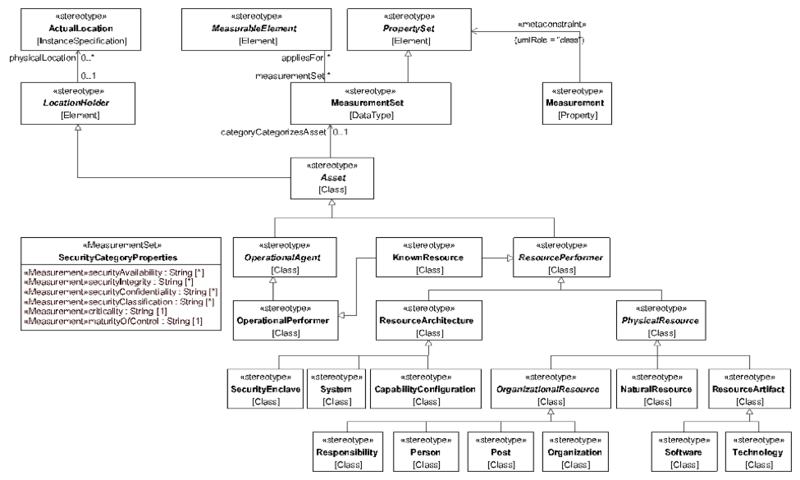 Data objects in BPMN can be typed by Information Elements that can be further detailed in ERDs. d) Most of the questions can be addressed using BMM. Combining BMM to UAF was not a requirement for UAF 1.0. This might be considered in the future versions of the standard. 3. http://www.modaf.org.uk/vExamples/163/search-and-rescue-example also does not work (although the Internet Archive has two snapshots of this page from 2008, it turns out that the page has little content: http://web.archive.org/web/20081120133043/http://www.modaf.org.uk/vExamples/163/search-and-rescue-example). (Reported by Andrew Watson on behalf of Cary Cupka <cary@cupkafamily.com>). 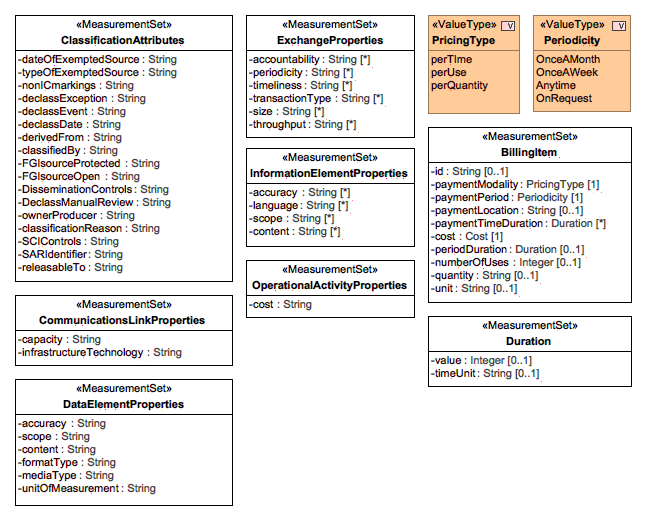 You have a package called information for data model (perspective or domain). you have another package also called information under metadata package (and others). Should rename the second one to information metadata just to make them distinguishable. 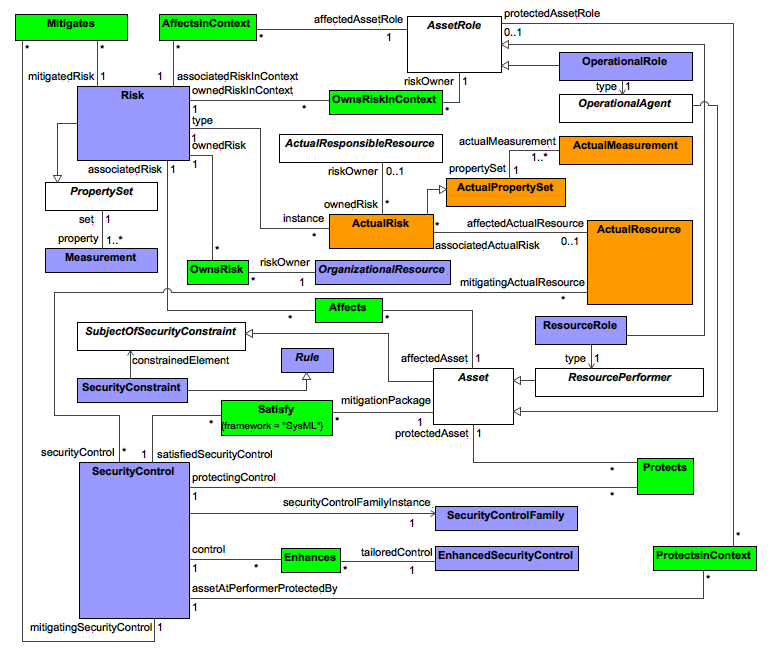 Package Information set by the namespace context of the owning package. 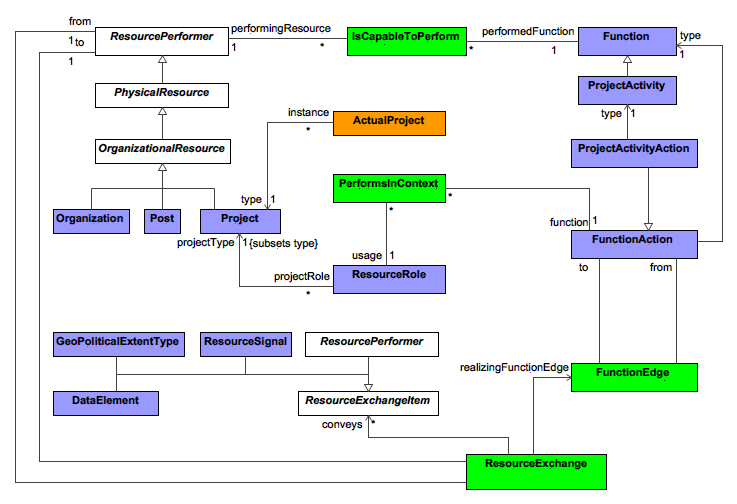 Resources Connectivity diagram is missing Function, Function action, Function control flow, Function object flow. 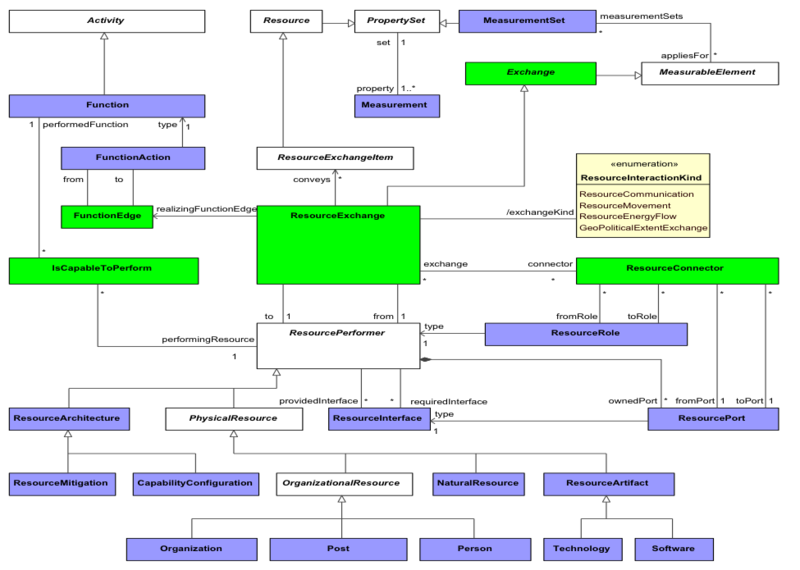 The DMM model for Service taxonomy states secific where it should be specific. 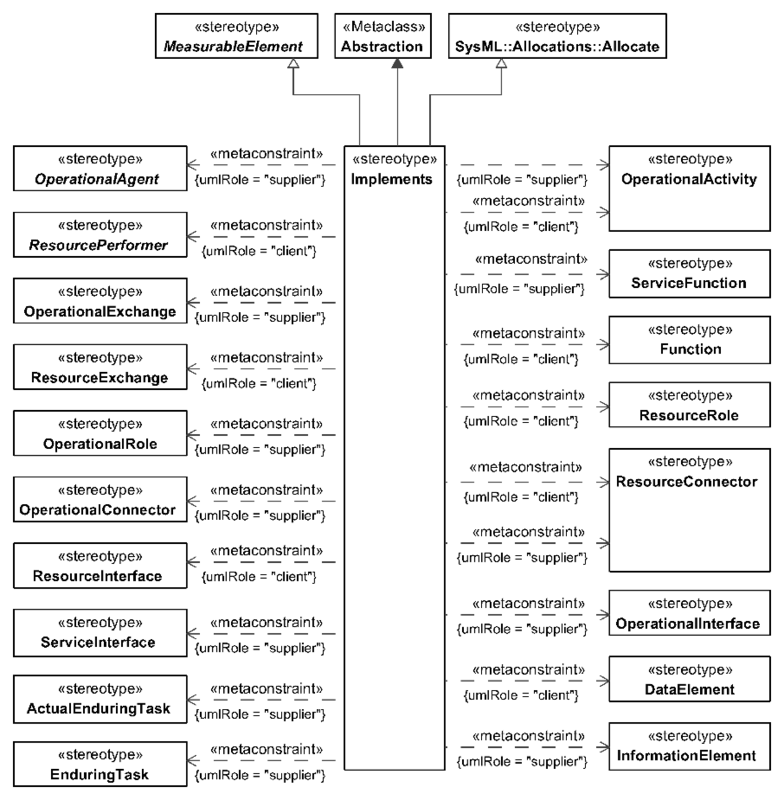 Typo: the DMM model for Service taxonomy states secific where it should be specific. Found it in the model the following day and modified it. 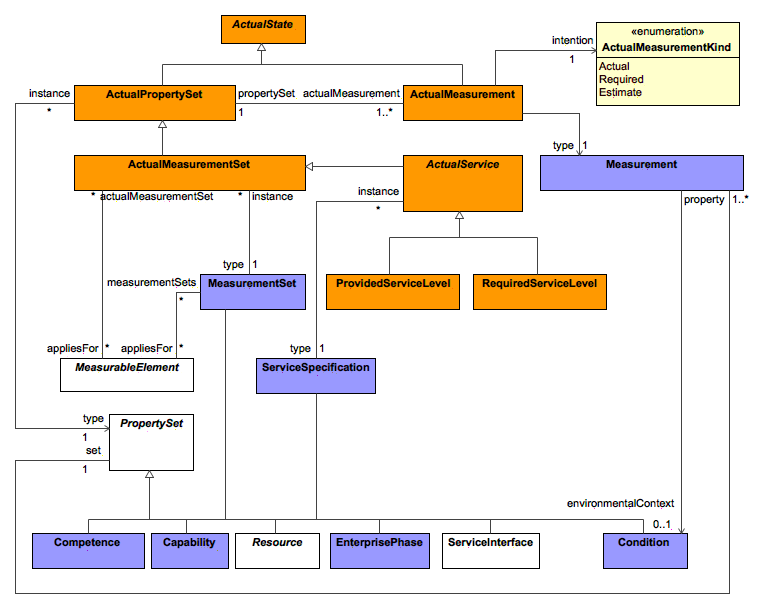 Make all specific references to SysML comply with the specification's normative reference to SysML 1.4 (see Section 3.2). 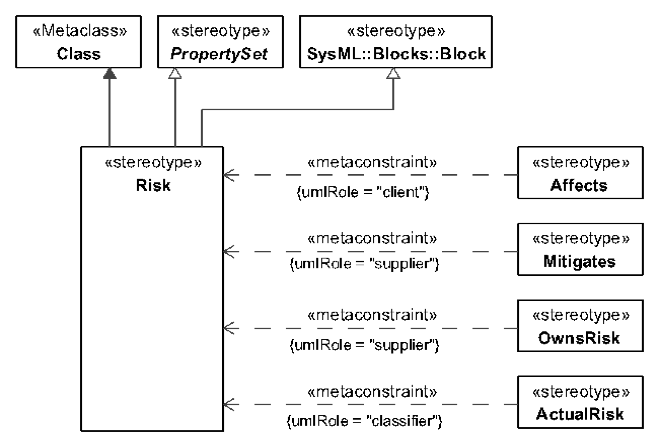 "UAFP 1.0 specifies one level of compliance corresponding to supporting a SysML TM profile using SysML v 1.3." 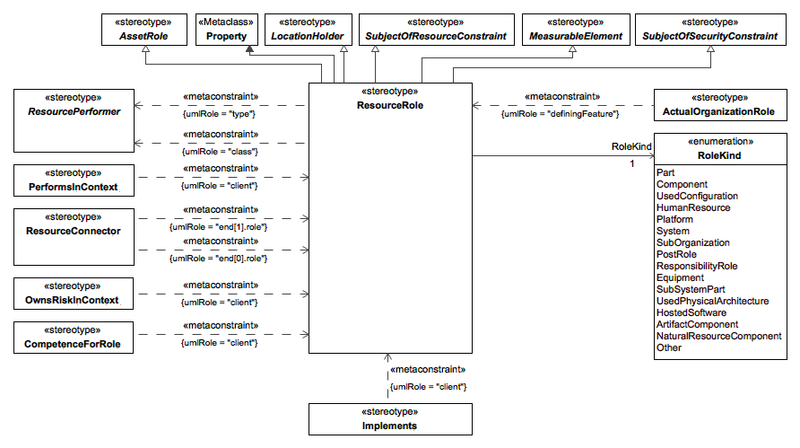 This specification documents the language architecture in terms of the UML 2 and SysML 1.3 parts..."